This map shows the most commonly used beaches for nesting sea turtles in Costa Rica. 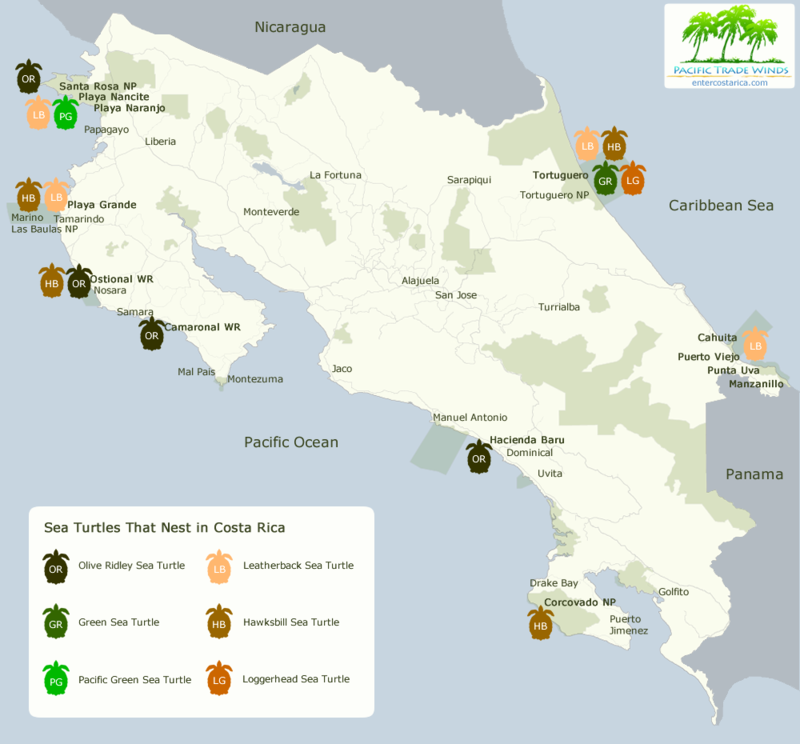 Click here to read more about Costa Rica sea turtles and their nesting habits. Click here to view the large version of this map. Santa Rosa National Park and Playa Nancite: Year round, but the best months are May through October. Ostional Wildlife Refuge: Year round, but the best months are May through October. Camaronal Wildlife Refuge: April through November. Hacienda Baru (and Playa Matapalo): mid-July through mid-October. Tortuguero National Park: mid-July through mid-October. Playa Naranjo: October through March. Playa Naranjo: mid-October through mid-February. Playa Grande: mid-October through mid-February. Tortuguero National Park: March through May. Cahuita National Park, Manzanillo: March through July. October through March in each location. Tortuguero National Park: July through October.